When wealthy businessman Phillip Colbert is found dead by a patrolling policeman in Sparta, Mississippi, Officer Sam Wood (Warren Oates) immediately assumes that the African American found loitering at the train station with excess cash in his wallet is the prime suspect, and his chief, Gillespie (Rod Steiger) is inclined to agree. 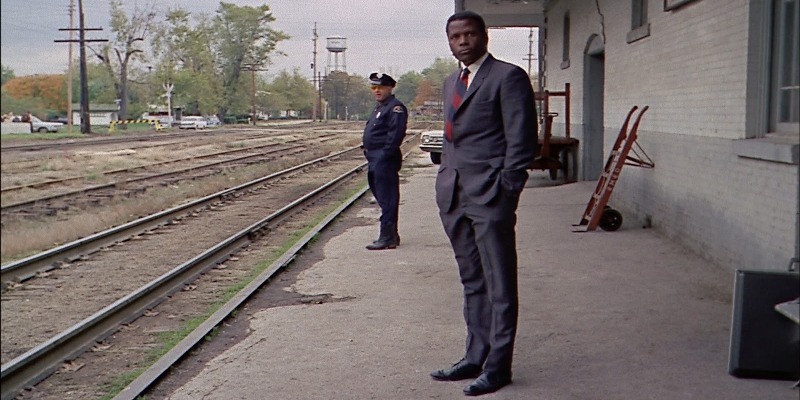 That is until they discover the man, Virgil Tibbs (Sidney Poitier), is an acclaimed and learned homicide detective from Philadelphia, who had been waiting for a connecting train after visiting his mother. After being prejudiced against and treated poorly, Tibbs wants nothing more than to catch his train and head home, but his own captain insists he stay and, when Colbert’s widow (Lee Grant) makes the same demand after Tibbs shows more detective skills than the Sparta force, Tibbs and Gillespie have no choice but to work together until the case is solved. In The Heat Of The Night is my Blind Spot pick for February, and is pretty much the perfect film I could have watched because not only did it win Best Picture at the Oscars in 1968 (as well as a few others we’ll get into shortly), but also because February is Black History Month over in America, and this film deals heavily with racism. It’d only be more perfect if there were a heavier romance angle to the film too, to coincide with Valentine’s Day, but Oscar wins and racism will have to do, I suppose. And the racism in the film isn’t overplayed. It’s extreme to say the least, culminating in an angry mob out for Tibbs’ blood for the joint crimes of slapping a man who slapped him first and being present in a room during a conversation, all whilst being black, of course, but it remains believable. Sickening, yes, but not over the top as might have been done with a heavier hand. There are also different degrees of racism on show, and different perspectives, which is what makes the film so interesting. For starters there’s Sam Wood, the officer who arrests Tibbs. Wood’s initial response to seeing Tibbs minding his own business at the train station is “On your feet, boy!” before having his hands planted against the wall, frisking and immediately installing Tibbs in the back of his police car and haul him down to the station, already referring to him as “The Prisoner” despite the meagre “evidence” available. Wood’s smug, self-satisfied grin when he tells Gillespie he’s got his man tells you everything you need to know about what he thinks of this newcomer. Gillespie on the other hand is similarly prejudiced as Wood, although to a slightly lesser extent, but his position of seniority requires him to not show it quite so blatantly. Gillespie, upon finding out Tibbs’ profession and abilities, more willing to accept the man’s help than the other way around, because he also has a responsibility to see justice done, yet his veneer cracks when Tibbs’ interference points out errors within Gillespie’s work. And of course Tibbs himself has a degree of racism to him too. He is far more eager to take on the case when his detective work leads him to racist plantation owner Endicott (Larry Gates), with Tibbs’ desires to send this man down blinding him to the truth. The acting performances are all terrific too, particularly Poitier and Steiger, though my mind has never been boggled quite as much as when I discovered yesterday – and this happened during a podcast, so my reaction has been documented – that whilst this film won the Best Lead Actor Oscar, that award went to Steiger and not Poitier. I’ll admit that Steiger is great here, and his depiction of a racist police captain learning to acknowledge and respect an African American officer is flawless, but this should have been Poitier’s nomination (and, in my opinion, subsequent loss to Paul Newman in Cool Hand Luke, but that’s a different matter). I suppose it could be argues that Steiger shows a greater range and is perhaps a showier role, but Poitier’s internal rage and the manner in which he handles his situations makes this nomination seem like a dreadful snub, and continues the case for the Academy’s racism. The only hole the story falls into is the overall whodunnit aspect, but at worst it’s a stumble more than a full-on trip. I’m the kind of guy who likes to guess and predict the outcome of films, but here on the first viewing I think that would have been nigh on impossible to put all the pieces together as several aren’t revealed until the last scene. In fact it seemed Tibbs himself was waiting to see who would show up instead of having the requisite detecting ability to predict it, but fine. This entry was posted in 09/10, 1001, Blind Spot, Choose Film, Review, The List and tagged Anthony James, In The Heat Of The Night, James Patterson, Larry Gates, Lee Grant, Norman Jewison, Quentin Dean, Rod Steiger, Scott Wilson, Sidney Poitier, Warren Oates by jaycluitt. Bookmark the permalink. This is a fantastic film for all the reasons you give. Both Poitier and Steiger were great n their roles, but yeah Poitier should’ve been nommed for the lead and Steiger as Supporting. Glad you enjoyed this! Thanks Dell, I’m glad it lived up to my expectations. I’m a big fan of this film, and a big part of that is how smart it is. This would be a 45 minute film except for the fact that, as you mention, Tibbs is blinded to the reality. He so wants a particular racist to be guilty that it prevents him from seeing the truth. It’s good screenwriting to not just give us the obvious racism, but to put a little bit of that even in the character we’re supposed to identify with. Yep, agreed, this script had far more layers than I was expecting, and is thoroughly deserving of a place on the List.